Gopal's openness to nature was shaped by howling waves at the Vishakhapatnam port where his father worked. 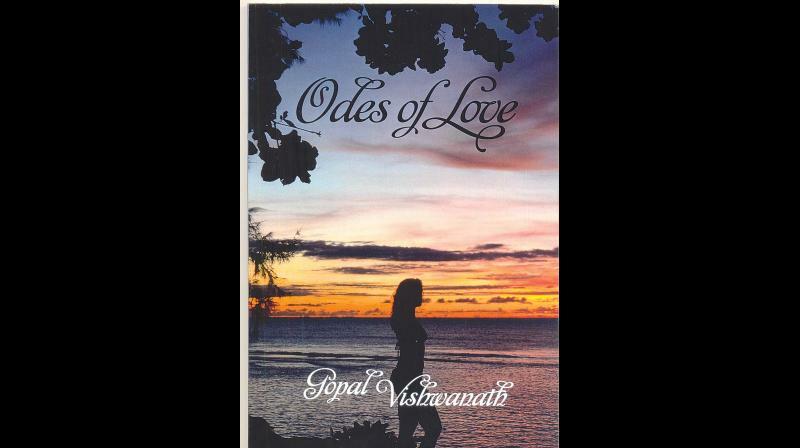 This heart-warming, occasionally hyperbolic, but overall humane and interesting collection of 25 poems, ranging from the profane to the profound, titled 'Odes of Love', by a senior marine chief engineer, Gopal Vishwanath, seems to come like romantic whistles from the 1970s' and early-1980s' to brighten trite hearts. Nevertheless, in these days of post-Truth and cultural cocksureness of one-size-fits-all-or-else-you-are-anti-national, Gopal Vishwanath, floating on large container vessels for most parts of the year, has courageously put together a thought-provoking collage of images, memories and metaphors, all to drive home a simple, wise message as old as the hills - that 'love' is the eternal binder of all good things in life. Stylistically, Gopal's collection reads more like modern free verse, which hidebound conservatives would look with cynicism, than lyrical poetry in the strict sense of the term. But interestingly, he calls them 'Odes of Love' and not 'Odes to Love'. For traditionally, an 'Ode' is mostly an 'Ode to something'. Expressing emotions in an exalted form with high imageries and in unabashed praise of something, some idea, or of some person are the very stuff of 'Odes' as we know it from our school days even for the non-littérateur. For the poet in this sea engineer, his early openness to nature and sensibilities were shaped by the ceaselessly howling waves at the Visakhapatnam port where his father had worked. And Gopal - only God knows, how many times, “my ship made its way across yet another Pacific crossing and I walked out of lighted interiors into a dark moonless night”- seeks to show through these plain verses how "powerful" an emotion 'love' can be. Going by a couple of recent interviews Gopal has given to some shipping publications in his professional circle, his father too was a mariner, with his family roots in village of Kumaramangalam in erstwhile composite South Arcot district of Tamil Nadu. An ex-Dufferinite, who sailed with the Scindias as Chief Engineer, Gopal's father subsequently, joined Vizag Port trust where the little boy grew up, the endless stream of ships, the majestic natural harbour and the amazing expanse of the sea guiding Gopal’s stars too. He also says his mother and wife Hema, have been powerful influences in his life. And all these naturally have poured out through his 'Odes of Love', not least his longing to be with his family and children, a feeling that comes out in his poems in this collection. The mariner may rationalise his sea-sickness and contemplate the beauty of the moon, the starlit, desolate and otherwise 'black' nights and intuit the essence of 'Truth' in a flash as it were and see its oneness with 'love', but ultimately every person likes to be hooked to a soul. The joy and comfort in that homecoming has been well marked out in Gopal's lines. Gopal prefaces a poem 'Dreams of Love' with a line from Bertrand Russell's 1930 classic, 'The Conquest of Happiness' thus: "Of all forms of caution, caution in love is perhaps the most fatal to true happiness." Gopal's fears there is a dream wherein his love is 'spurned' and the prospect of being sentenced to a 'lonely life of irrelevance'. But the poet here is not to be trounced by the 'prophets of doom'. The optimism about the 'Encompassing bonds of love' turns Gopal's dream-crisis into an exalted opportunity to impassionedly plead: "Oh! Dear, Do gaze into my eyes once more, Fill them with the gift of sight again." Thus the journey of Gopal's love moves on, from the 'gift of love', the 'language of the stars', 'lessons of love' to the 'Noble Woman' and so on, the poet seeking to manifest every emotion that nuances this broadest possible organic feeling called 'love' including its spiritual aspect. As the poet himself says, he hopes this collection would bring out the 'strengths of love' and how it means to people in all ages, not only by affirming the larger respect for women, but also as something that could "strengthen the bonds of marriage'. The 'family' is substantially the centrepiece of Gopal Vishwanath's mediations on 'love' here, which is very commendable, as families' world over face disintegration today. He has also sees this collection as a tribute to the multi-faceted genius of his fellow-mariners at sea. There is yet the larger world of harsh external realities. As the well known American Sociologist Peter L. Berger wrote in perhaps the best years of post-World War-II liberal ethos, there are myriad shades to love, not just romantic love. From the Platonic, Biblical notions of love and self-effacement, the modern Freudian intonations to post-modern surrealistic expressions, meditations are aplenty. With his own inimitable humour, Peter Berger said, "people no longer fall in love." When lots of other things are fulfilled, they "allow themselves to fall in love". That game-changing human dilemma, sans very few exceptions, continues even to this day, perhaps grist to Gopal's next round of reflections.